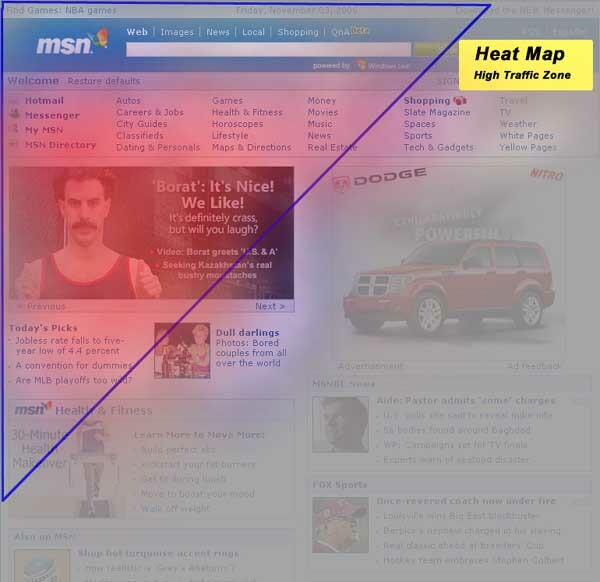 Heatmap Marketing illustration with MSN homepage as example of most common heatmap configuration. 1. Conversion rate considerations apply here. What can I place here to create a conversion? Definition: Conversion Rate; The relationship between visitors to a web site and actions considered to be a “conversion,” such as a sale or request to receive more information. This number is often expressed as a percentage. 2. What “tried and true” conversion techniques should I consider? 1. Offer a 3-Day Sale on Goods or Services, rotate items on sale regularly. Or, offer a “Free Consulation” by phone. 2. Offer clients visiting your website a “free incentive”. This is usually an ebook that you can buy for a small, onetime fee, but then distribute freely on your website. You then add references to this on many pages of your website, then you may want to collect simply a name and email address before allowing the “free download”. Without question this technique made made countless millionaires both on the web and off. 3. Start a Monthly e-Newsletter. While this technique does not apply to all industries online, it certainly does to most. Build Your Business with Email.